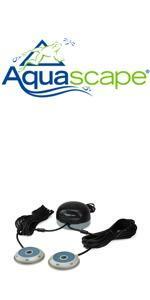 Quick to set up and easy to use, Aquascape's Pond Air Aeration Kits will effectively oxygenate your pond. 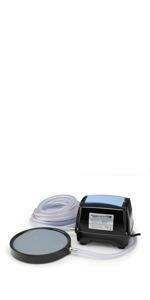 Available in two- and four-outlet options, the Pond Air kit is made up of an aerator pump that's placed above ground and two or four aeration discs that are placed in your pond. 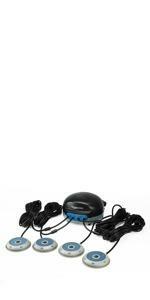 The Pond Air provides years of trouble-free operation and comes complete with everything you need. It features a strong outer housing, a thick rubber gasket that helps reduce noise and vibration, and a wide, flat base that makes it stable and easy to place. Every process that happens in the pond is dependent on oxygen. This is especially important at night when plants are not converting sunlight into oxygen. Dissolved oxygen levels are also generally lower in warmer water temperatures. Pond aerators oxygenate your pond, helping all biological processes and create a more stable environment, resulting in healthier fish and plants. Durable outer housing prevents damage. Provides years of trouble-free operation. Includes winter resistant airline, preassembled check valves, and weighted air stones. Play It Koi Pro-Tip: For the Aquascape Pond Air 2 and Pond Air 4 we always recommend that our customers have an extra set of Aquascape Pond Air Aeration Replacement Diffuser Discs on hand. Oxygenate water is critical for the health & survival of your koi fish and other pond animals and the aeration discs do clog up and need replacing over time. Actual time will vary depending on your water quality and other environmental factors such as sunlight, nutrients, etc. Extra discs always seem to come in handy.